When disappointment comes, lineages fray, tragedy breaks a heart . . . what to do? Sometimes what you need to see, when you need to see it, becomes visible before your very eyes. I looked over my shoulder and saw something that literally took my breath away. 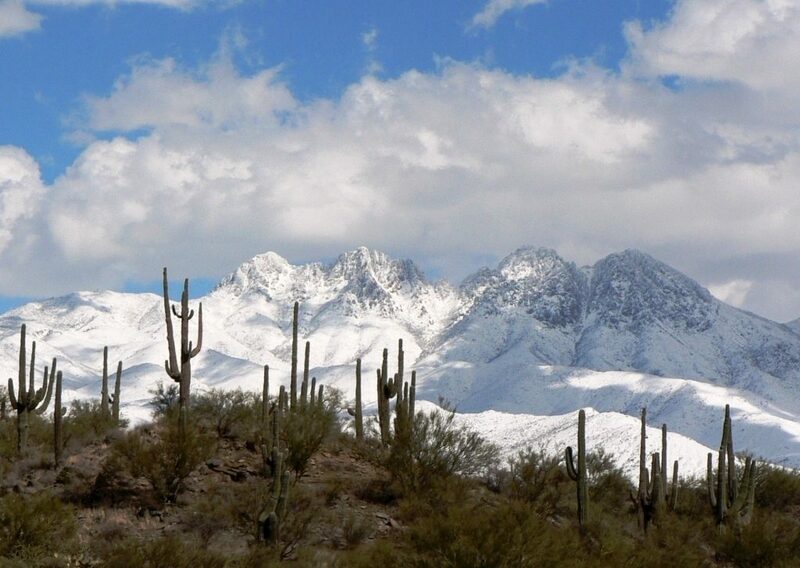 A mountain I’ve known since my childhood in the desert, four glorious peaks rising up to the clouds, was cloaked entirely in snow. For years I looked at that four-pronged landmark in the Mazatzal Mountains and gazed upon its beautiful mass and contours as something familiar and dependable as breath itself. 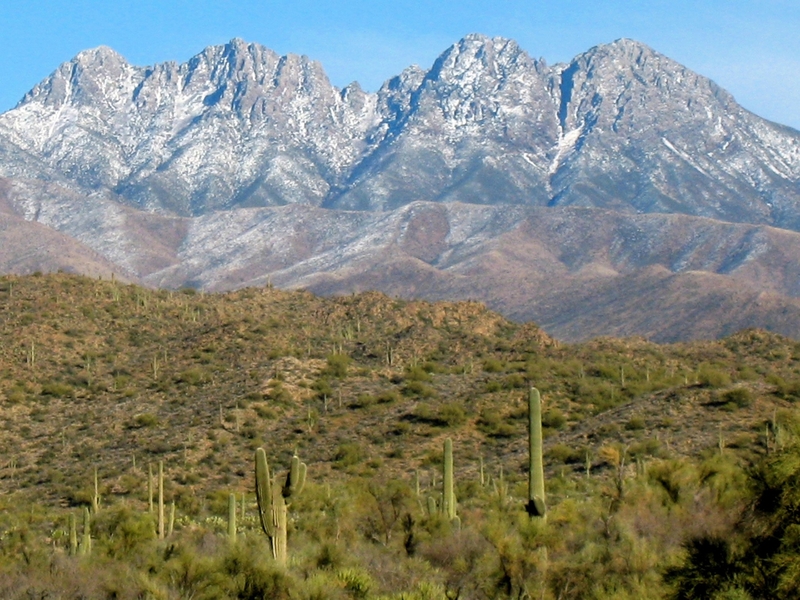 Even upon return visits from my home in the foothills of the Colorado Rockies to the Sonoran Desert in Arizona, the lure of Four Peaks just 40 miles east-northeast of Phoenix in Tonto National Forest continues to exude a protective mystique over all the inhabitants, flora, and fauna in the desert below. I’ve witnessed fluctuating hues grace granite in purple, rose, amber, and greenish-slate during the subtle nuances of daily and seasonal light. Dustings of white and even fully-tipped peaks have occasionally arrayed the summit, but oh my! I’d never seen the mountain glistening head-to-toe, fully snow-covered, as it gloried on the cusp of last month’s final days of February and the first emerging days of March. 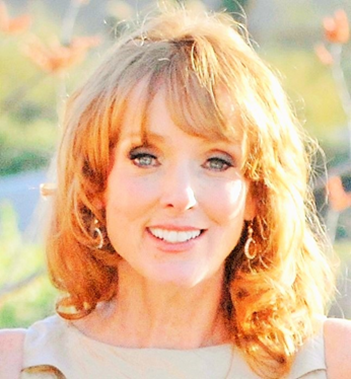 There’s always a mountain you can find in ancient oral and written traditions. Consider Mount Olympus, home of the Greek gods in Homer’s The Iliad. Or, the holy mountains of Sinai and Horeb in the Old Testament and Torah where God gave Moses the Ten Commandments and revelation in a burning bush. Or, sacred Tava, commonly known as Pike’s Peak, where the Utes’ beloved sun gave forth life from the Creator. Mountain of woe, mountain of joy, mountain of revelation, mountain of serendipity, you name it, it’s all there in the ancient literary traditions. 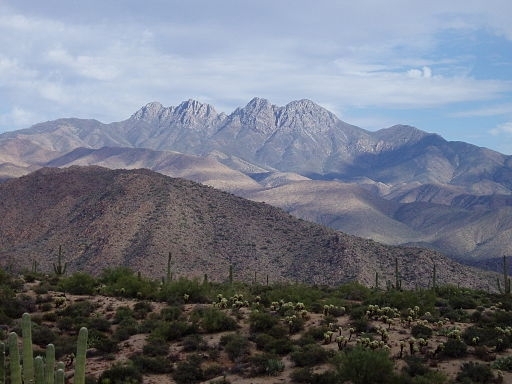 But on that particular day when I looked up to the splendor of Four Peaks robed in a full-length gown of shimmering white sequins from where I stood amidst the thorns of saguaro and ocotillo, I felt like I was gazing upon Wisdom herself.